Took this group shot of village girls in a school in Zaheerabad. 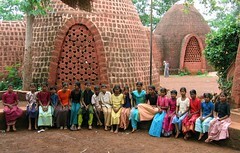 Those structures are unique beehive mud and brick architecture. There are a couple of boys also. Rural setting, rural children. Telengana, AP.